The most popular tourist attractions of Norfolk County (pop. 63, 175) are the ports, towns and villages along Lake Erie, known as Ontario’s South Coast. These towns include Port Dover, Turkey Point and Long Point. Fishing is another key attraction for tourists, as well as birding, hiking, camping and cycling. Agri-tourism is another expanding attraction for tourists coming to Norfolk County, with wineries and microbreweries, and farm-related events. Norfolk County is #1 in Agriculture in Ontario and is also known as Ontario’s Garden. Norfolk County farmers are Canada’s Number One growers of asparagus, cabbage, sour cherries, ginseng, other specialty vegetables, peppers, pumpkin, squash, zucchini, strawberries, sweet corn and sweet potatoes.Norfolk County is also Ontario’s Number One grower of blueberries, rye and Saskatoon berries. 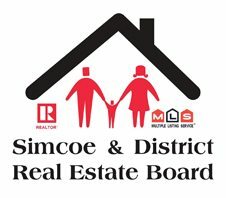 The REALTORS® of the Simcoe and District Real Estate Board welcome you to move to beautiful Norfolk County.